This is the fourth in a series of comments CommunityAIR submitted on Wednesday, May 20, on the Proposed Environmental Assessment (EA) Study Design/Scope in what has been described by people with experience in such matters as a sham EA. CommunityAIR’s comments cover 11 subject areas, are extensive and pointed, and are best digested slowly. They are listed below and will be presented individually over the next few weeks. The NOW magazine article, Island airport: expansion distraction, explains how PortsToronto has shifted the goalpost from a traditional EA to an EA that is looking for ways to expand the airport, rather than judging whether expansion is feasible and desirable or not. 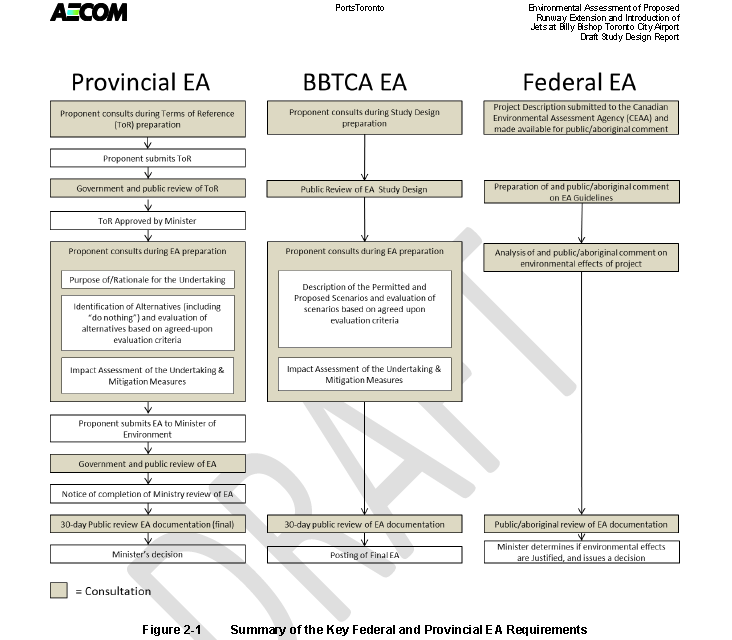 Figure 2‑1 [page 6] indicates the flawed nature of this exercise – unlike a provincial environmental assessment, the proponent does not determine the scope and acceptability of the assessment – the Ontario government does. Here, by contrast, the proponent – PortsToronto/Porter ‑ determines the scope and approves its hand‑picked consultants’ work. And, unlike provincial EAs, there is only a 30‑day window for the public to review the report. Not the “robust” public engagement required by the City. What happened to the iterative process that was discussed, that would share the EA work and its interplay with the “Master Plan”, the runway design and the Bathurst Quay Precinct Study, as they all evolve? Alternatives Only one is proposed to jet expansion – massive expansion within the existing rules. Maintaining the status quo without even permitted expansion – or, for that matter, the absence of the Airport, are alternatives that could be explored under a provincial EA. This work is designed to force acceptance of an expanded airport operation – one way or another. The 2012 Master Plan was prepared under conditions outlined in the current Tripartite Agreement and as such, provides a framework for the future permitted growth of the airport. What it does do is set out a host of unsolvable barriers to either of the expansion alternatives being considered. The provision of public parking is significantly undersized given the level of passenger activity. Industry planning guidelines suggest a provision of approximately 1,000 – 3,000 parking stalls per 1 million enplaned passengers. With approximately 1.5 million passengers, the unrestrained demand for parking at BBTCA would be approximately 750 – 2,000 parking stalls. The area of the combined services building allocated for airport maintenance is comprised of four equipment bays and support areas. This facility is not sufficient to accommodate the full needs of the Airport. With the rapid increase in air carrier activity over the past two years and the allocation of all of the 202 slots available for scheduled air carriers, it is very likely that BBTCA has reached its theoretical capacity of 140,703 movements. Even with modest (1-2%) growth in the other general aviation sectors, the TPA may have to implement measures next year to manage aviation activities. Victoria Airport: 1.4 million annual passengers, curb length of 200m. The current capacity of the two taxi queuing lanes is approximately thirty-four vehicles, which during peak periods is at over-capacity. As a result, taxis often stand on the northbound curb lane of Eireann Quay, which presents a significant congestion and safety concern. …As a result, the TPA is left with an overall taxi system that has far more demand than capacity, and is without any realistic short-term and cost effective mitigating solutions. There were no answers from PortsToronto or its consultants on any of these in any of the public meetings, and no indication that any of them are being considered. We had fully expected the “community consultation” held on March 31 would, at least, address all of these issues identified by the same PortsToronto consultant presenting at the meeting. They were not even referred to at the meeting.